It had to happen. 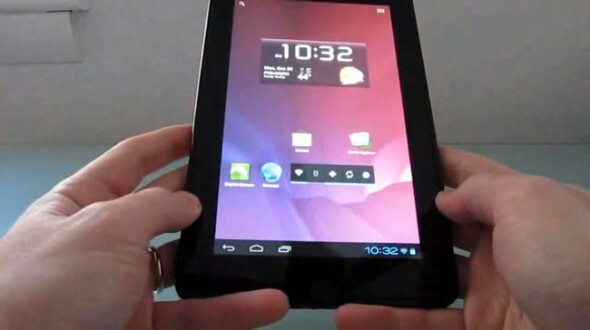 Someone was bound to get Android 4.0 Ice Cream Sandwich running on Amazon’s budget conscious 7-inch Kindle Fire tablet. Thanks to the Android developer community a pre-alpha version of Ice Cream Sandwich (ICS) can now be seen running on the Fire and if you are feeling extremely adventurous you can go ahead and download the test ROM to start tinkering. The pre-alpha ROM is based on the public Android Open Source Project (AOSP) release of ICS, and judging from the video, things are going well on the development front. Main issues are with audio and video not always working properly. The video and download link are after the break. 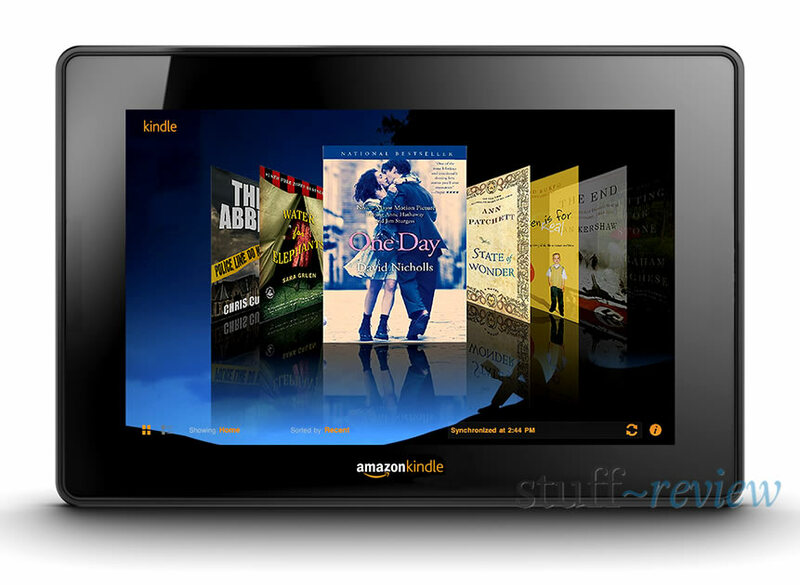 One of the limitations of Amazon’s new 7-inch Kindle Fire tablet, is that you are restricted to the apps available on Amazon’s Appstore for Android rather than the full Android Market. So what happens when you want to use an app that’s available in the Android Market but hasn’t yet reached Amazon’s store. There is actually a not-too-complicated way around that limitation. Although, if you wanted to sideload applications on the B&N Nook Color you had to actually root it first, Amazon hasn’t really locked-down the Kindle Fire. It all falls down to enabling a simple option in settings. Barnes & Noble is preparing its own 7-inch budget and book/magazine-centric Nook Tablet to rival the Amazon Kindle Fire. Where the Nook Color was lacking, the Nook Tablet has more than made up for it. On one hand, the Nook Tablet, has a faster processor than the Kindle fire, it’s lighter, has double the RAM and on-board storage and can take microSD cards. On the other hand Amazon has a huge cloud presence and a bigger library in terms of content — books, music, movies. The Amazon Appstore also has a bigger selection of apps. Confused? Well, we’ve got all the details for both devices for you in a handy comparison chart, which you’ll find after the break. 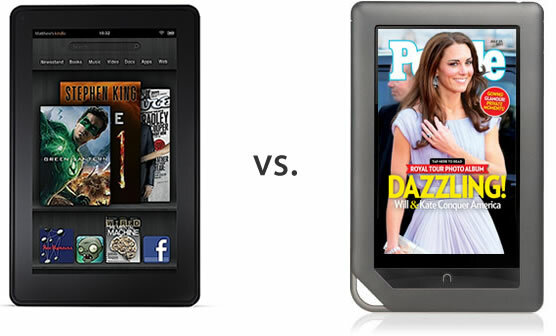 You might also want to check our initial Kindle Fire vs. Nook Color comparison. It’s no secret that the upcoming Amazon Kindle Fire tablet has B&N’s Nook Color (NC) in its sights. The two have a lot in common, both have books and magazines deeply embedded in their DNA and both run a very customized Android experience, they are also two of the cheapest 7-inch Android tablet offerings out there. It might not be completely fair to compare the two though, as the Nook Color is a year older, but until B&N comes out with a Nook Color 2, it remains the Kindle Fire’s main competitor. The Fire wins in terms of processing power and initial reports state that the experience is very smooth, the NC can get a bit slow at times, showing its age. Amazon has a huge cloud presence and its putting it to work with the Fire, which lacks on storage options, Amazon envisions your music and videos stored in its cloud. The Fire also utilizes Amazon’s cloud with its Silk browser which will offer an accelerated browsing experience. Neither tablet has access to the official Android Market, but the Fire wins in this regard, because the Amazon app store simply has more apps than the Nook. On the other hand the Nook Color is one of the most ‘hackable’ devices out there, so if you get bored with B&N’s customized experience you can quite easily run standard Android with the full Android Market. The Nook Color also wins on looks; the Fire is a standard all-black rounded affair. For the full spec lowdown between the Fire and the NC head after the break. Be sure to also read our very extensive review of the Nook Color and how much we like its magazine app. 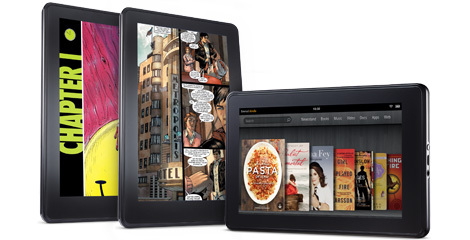 So, it´s here; Amazon has officially entered the tablet wars with a bang. Jeff Bezos announced today Amazon’s 7-inch tablet, which will be priced even lower than what was initially expected. 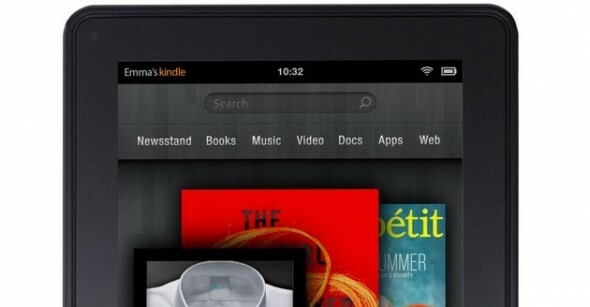 The Kindle Fire, can be pre-ordered now for $199, $50 less than the Nook Color and less than half the price of most other Android tablets and the iPad 2. Despite the price however, the Kindle Fire, is a solid device, if not a bit barebones. A 7-inch IPS display with a 1024 x 600 resolution, dominates the front, featuring Gorilla Glass protection. The Fire runs a TI OMAP4 dual-core processor (but no specifics on speed), it also has 8GB of built-in storage and the battery is advertised to last for eight hours of reading or 7.5 hours of video playback. As rumored, the device is very similar in design to the BlackBerry Playbook, measuring 7.5 x 4.7 x 0.45 inches (190 x 120 x 11.5mm) and weighing 14.6 ounces (413g). There is no camera, no microphone, no GPS, no Bluetooth and no card reader. The Kindle Fire only has a 3.5mm headphone jack, a charge port and a pair of stereo speakers. The back is rubberized, like the Nook Color and the Playbook. We first reported on an upcoming Android tablet from Amazon a few weeks ago, to be announced and released this fall. Well, Amazon has been sending out invites for a media event this Wednesday, 28th; definitely a ripe time to announce their rumored 7-inch tablet (see our mockup above). Obviously, a new Android tablet is not big news nowadays. The big news, would come in terms of pricing, with the Kindle Tablet — or Kindle Fire as reported by TechCrunch — selling for around $250 in order to undercut the competition; while putting it in direct line of fire to the B&N Nook Color.